Why Is This BMW M5 Wagon Worth $130,000? Only two models were built in this specific color combination. This 1995 BMW M5 Touring currently for sale at Ohio-based BMW specialist dealer Enthusiast Auto Group is a very unusual sight. Not only did BMW build just 891 examples of the high-performance wagon, it was never officially sold in America, much like the current 5 Series Touring. And just to make it even more unusual, it’s finished in a rare color combination. According to Enthusiast Auto, it's one of only two models in the world finished in Santorin Blue over a Lotus White nappa leather interior with Santorini Blue accents that match the interior. Its rarity probably explains why this dealer thinks it can justify selling a 22-year-old wagon for a whopping $129,900. That price only seems more absurd when you look at the mileage. During its lifetime, the M5 Touring has clocked up 96,206 miles, but it appears to be in exemplary condition considering its age and high-mileage. It’s been well maintained, too. At 88,856 miles, Enthusiast Auto performed an extensive engine out service and also enhanced the performance with a 3:64 limited slip differential, performance shifter, race muffler, and an ECU tune among other modifications. It was imported into the US by its second owner in 2000. 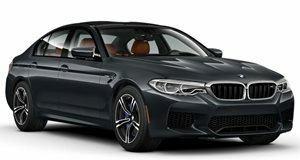 The potent performance wagon packs a 3.8-liter inline six engine that originally produced 335 horsepower mated to a six-speed manual gearbox. In stock form, the E34 M5 could sprint from 0-62 mph in six seconds. While the E34-generation may not be the most desirable M5 ever made, this performance wagon is infinitely more exciting than the practical crossovers that currently flood the market. At the time, it was the first M wagon BMW ever made so it has some historical significance, and the model for sale represents its final year of production, making it desirable for BMW collectors. BMW never made an M5 wagon for the following E39 generation, either. BMW also isn’t planning to make a wagon based on the new M5, despite selling the 5-Series Touring in Europe. Still, that price is hard to swallow considering you can buy a brand-new Mercedes-AMG E63 wagon for around the same price.